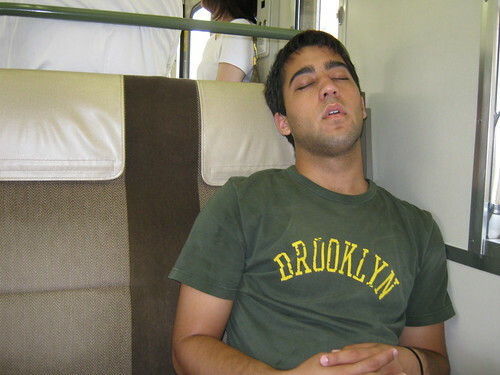 This is what I think happens to Min after reading these baseball posts. 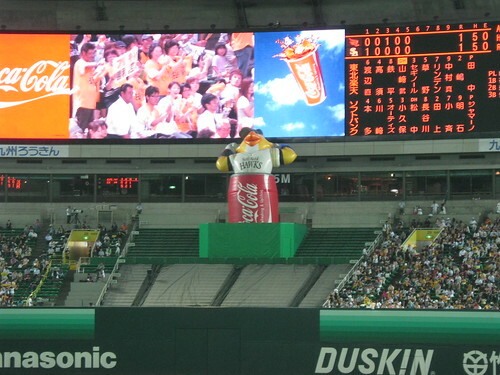 Orix Buffaloes (21) at Hiroshima Carp (10). What in god’s name happened here? 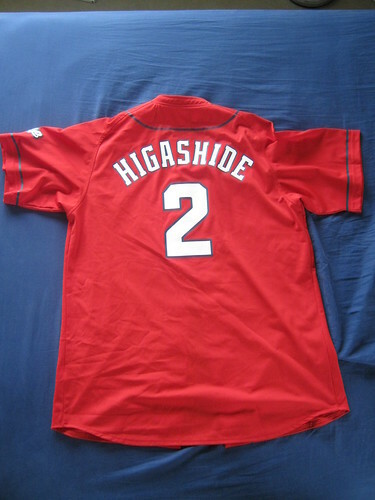 Only two of the seven pitchers Hiroshima sent out to the mound managed to not give up a run. 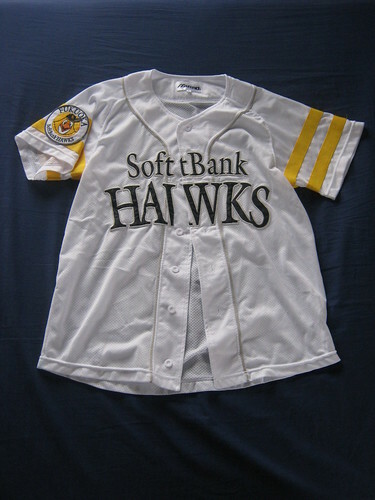 This game was UGLY, featuring five home runs by Orix and two by Hiroshima catcher Yoshiyuki Ishihara. The Carp record is 22-34-1, which, remarkably, puts them in fourth, somehow. 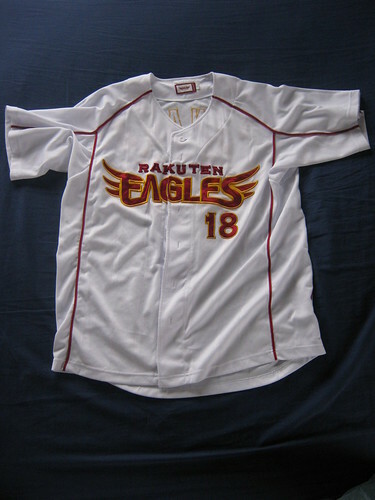 Rakuten Eagles (0) at Yomiuri Giants (1). Darrel Rasner is really starting to pitch like he wants to keep his job. 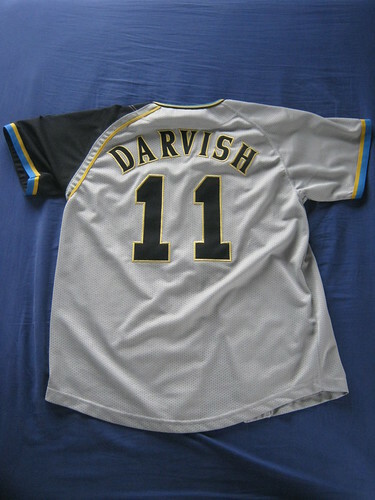 Nice work, Darrel, but the Rakuten record falls to 28-30-1 in fifth. After embarrassing the team, acting like a primadonna, insulting the manager, and making everyone involved look bad, Hanley Ramirez either apologized to his teammates or the team has decided not to make a fuss about it, because he was back in the lineup last night doing fairly well. Thank god that’s over. 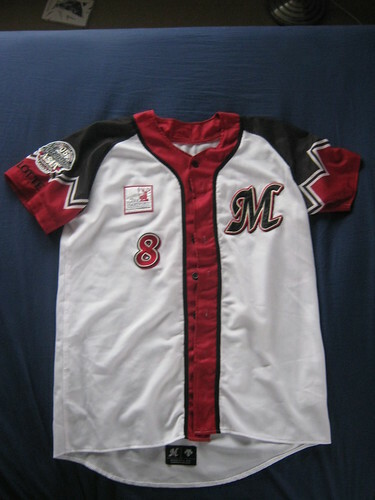 The Marlins are rarely in the news, but I don’t want them in there because of this. 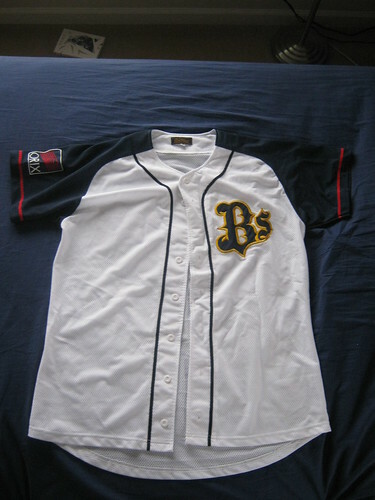 Hiroshima Carp (8) at Orix Buffaloes (2). 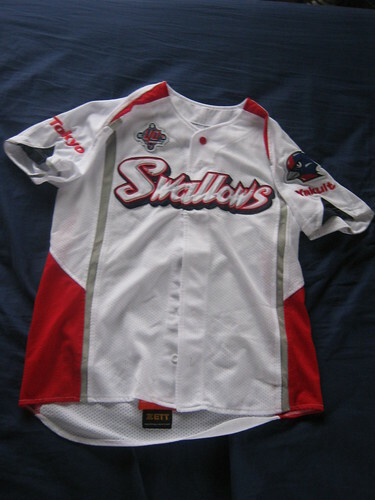 Eric Stults notches his first win as the Carp manage to come out of their ten-games-under-0.500 hole for a day. Their record rises to 17-26-0 at a manageable 10.5 games back. That was sarcasm. 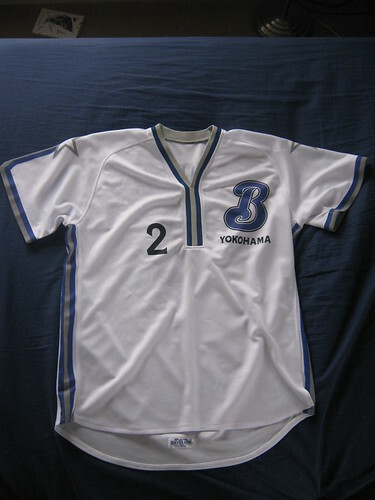 Yokohama BayStars (3) at Rakuten Eagles (2). Darrell Rasner actually tosses a great game against Yokohama, but the runs he gives up are just enough to combine with an unearned for the loss. Rakuten falls to 19-26-0, tying them with the 19-26-1 Fighters. Tampa Bay Rays (10) at New York Yankees (6). Wade Davis and the powerful Rays offense combine to push this game increasingly out of New York’s reach. The lead rises to four games as Tampa Bay moves to a 29-11 record. New York Mets (3) at Washington Nationals (5). Liván Hernández continues his dominant streak as he holds down the Mets for Drew Storen to come in for the win for Washington, boosting them out of their five game losing streak. The Nats record increases to 21-20 in third place. Baltimore Orioles (3) at Texas Rangers (4). Guthrie puts together quite the game, but the Orioles bullpen can’t hold on, giving them their 28th loss. Florida Marlins (5) at St. Louis Cardinals (1). The back-to-back shutout is prevented, but that doesn’t mean that Aníbal Sánchez didn’t have electric stuff last night. 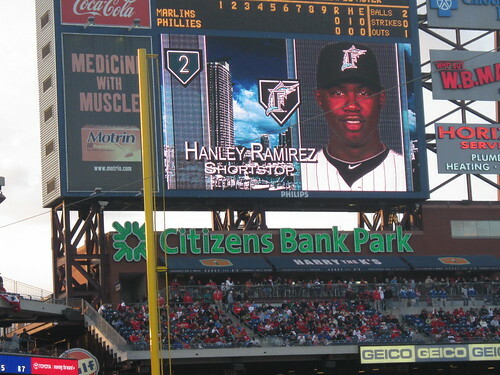 Florida’s off-field woes stayed off-field as Hanley went 3-5 with an RBI and the rest of the team contributed as well. Florida’s 22-19 record is good enough for second, but with the Nats breathing down their necks can they hold on against Adam Wainwright tonight? Josh Johnson tosses a shutout and the Rays win, but the red teams I love (Eagles, Carp, to a certain extent, the Nats) lose. 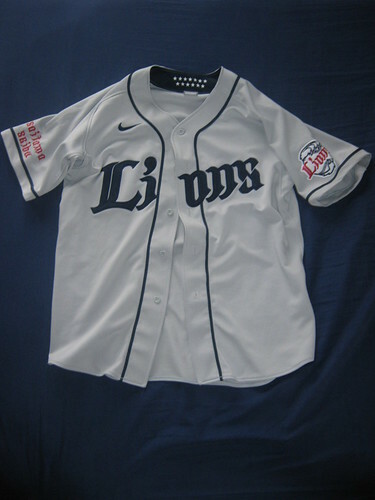 Hiroshima Carp (2) at Orix Buffaloes (11). 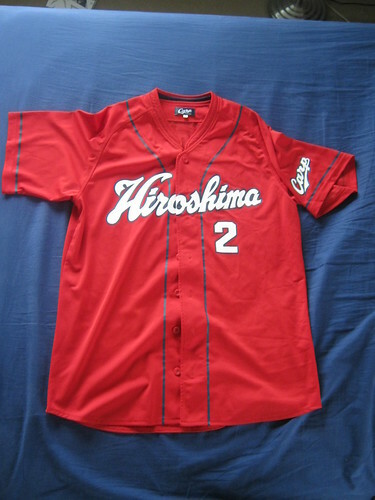 Somehow I don’t think Hiroshima is going to win the Interleague title. The Carp drop to 16-26-0 in fifth. Their only saving grace is that the Swallows have been absolutely sucking recently, keeping them out of last. Yokohama BayStars (7) at Rakuten Eagles (5). Marty Brown and the Eagles are having a real tough go of the season. 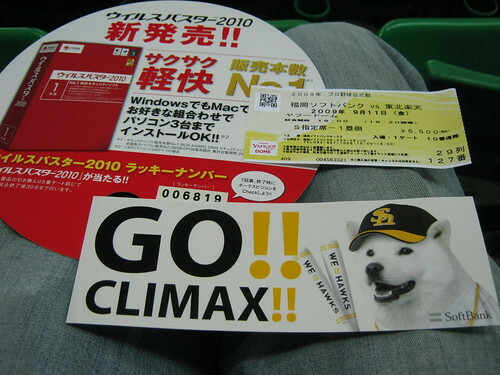 If they want to go to the Climax Series, they’re gonna have to step it up, but they’re also gonna need serious pitching. Rakuten drops back into fifth with their 19-25-0 record. 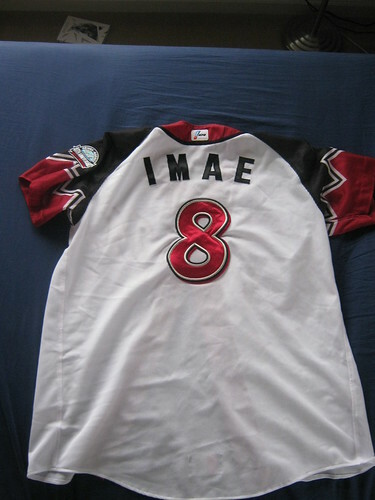 Arizona Diamondbacks (0) at Florida Marlins (8). It sure is nice to see Josh Johnson dominate a team, even one so mediocre as Arizona. JJ threw seven glorious innings, allowing us to forget about all the Hanley Ramirez drama from last night. Florida’s record improves to 21-19, four games behind the Phillies. Cleveland Indians (2) at Tampa Bay Rays (6). A game the Rays should never lose. They don’t disappoint. Their first place lead rises to three games with their 28-11 record. Kansas City Royals (3) at Baltimore Orioles (4). Another win eludes Greinke, but this time it’s kind of his fault. The Orioles offense notches two against the guy, proving that he is human. Baltimore’s record improves to 13-27. They’re only seven games away from the fourth place Red Sox. Washington Nationals (2) at St. Louis Cardinals (3). Chris Carpenter does what he does best and limits the Nats to two. 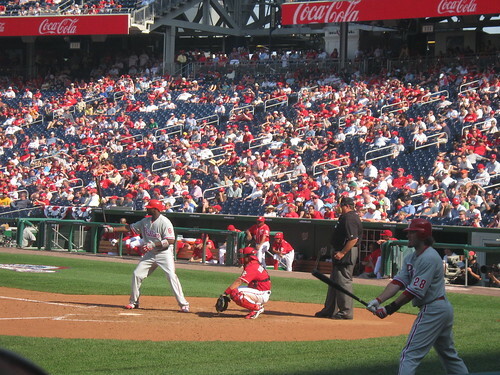 Clippard has an uncharacteristically bad moment and surrenders a homer to Ryan Ludwick. That’s all it takes to lose a game. The Nats are in third with their 20-20 record after a heartbreaking five-game skid. No witty captions today, sorry. 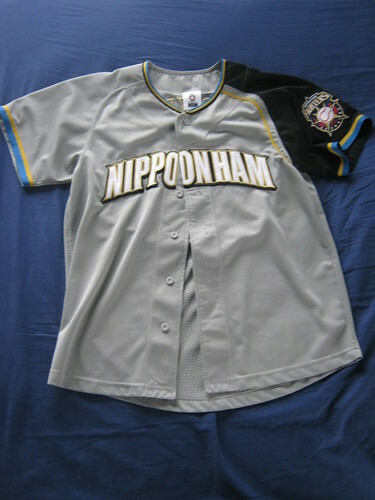 Hiroshima Carp (0) at Yokohama Baystars (5). Not the outcome I would have expected, but Yokohama is deceptively strong at times (and Hiroshima is pretty weak this year). 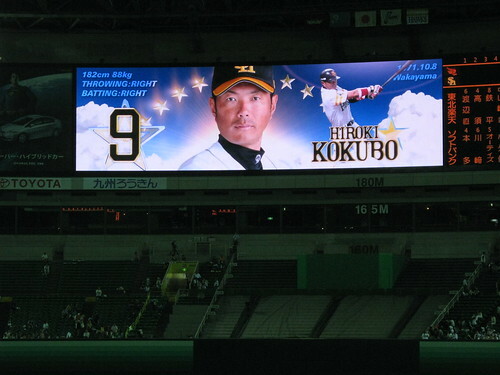 Orix Buffaloes (8) at Rakuten Eagles (3). 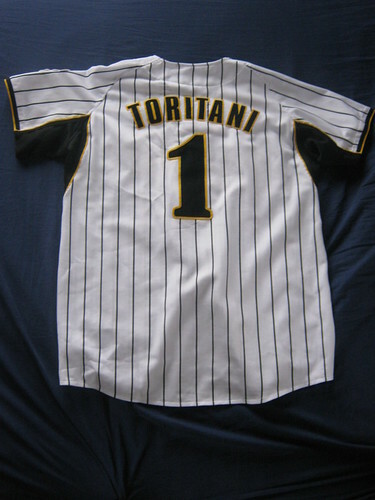 Orix made some serious upgrades in the off-season, but I wonder if they can keep this pace up all season. Toronto Blue Jays (7) at Baltimore Orioles (6). The Orioles blow their home opener and not many are surprised. Tough break for the (orange) birds. Los Angeles Dodgers (7) at Florida Marlins (3). Tough loss for the Fish who had an awful showing for their home opener. New York Yankees (3) at Tampa Bay Rays (9). David Price might just have that season everyone thought he would have last year this year. Washington Nationals (2) at New York Mets (8). About what you’d expect. 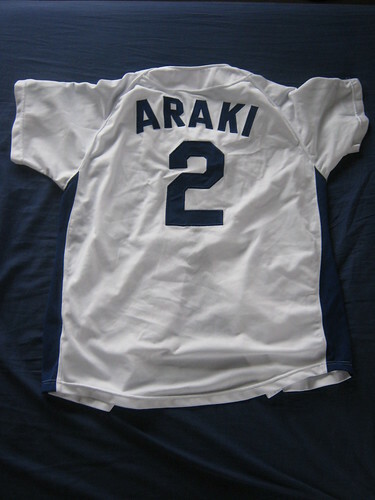 Carp (7) at Baystars (3). Now that’s what I’m talking about. Buffaloes (1) at Eagles (6). More wins for my teams. Nationals (4) at Mets (3). Surprising comeback for the Nats (almost any win is kind of surprising for them). Can they take the rubber game too? Yankees (10) at Rays (0). An embarrassing shutout in which C.C. Sabathia throws 8 innings of no-hitter baseball. This one hurt. Blue Jays (3) at Orioles (0). At least it wasn’t the Orioles closer who blew this game. Dodgers (6) at Marlins (7). Walk-off wins are always nice. Buffaloes (1) at Eagles (4). Yet another win for the Eagles. Their record rises to 7-10-0 for the weekend, but they’re still in fifth by 1.5 games. 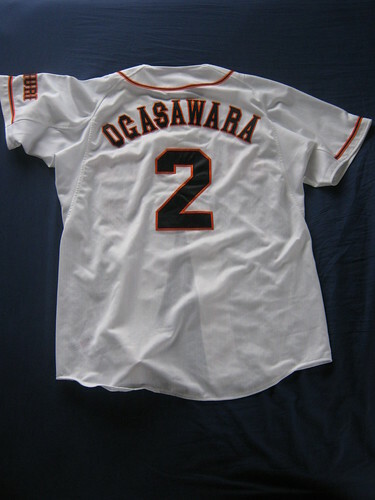 Carp (3) at Baystars (6). It’s good to see them scoring runs, but the Carp couldn’t take the series. Their record falls to 4-10-0, but they’re surprisingly only 5.5 games back from first and 1.5 from fifth. Nationals (5) at Mets (2). Washington takes the series with a huge win over Johan Santana who gave up a grand slam to Josh Willingham. The Nats are a decent 3-3 and tied for third (with Atlanta) in the NL East. Dodgers (5) at Marlins (6). Another close one that the Fish won thanks to the powerful bat of the Mexican slugger, Jorge Cantú. The Marlins now have a 4-2 record and sole control of second in the NL East. Blue Jays (5) at Orioles (2). Baltimore needs to do something (but not for the next three games against Tampa) to start turning this team around. They are 1-5 in last for the AL East which, surprisingly, has Toronto leading it at 5-1. Yankees (7) at Rays (3). Another tough loss to swallow, but Tampa Bay needs to turn around and beat up on the Os to lift their record and spirits before they head to Boston at the end of the week. Tampa Bay is 3-3 and tied for third with the BoSox. 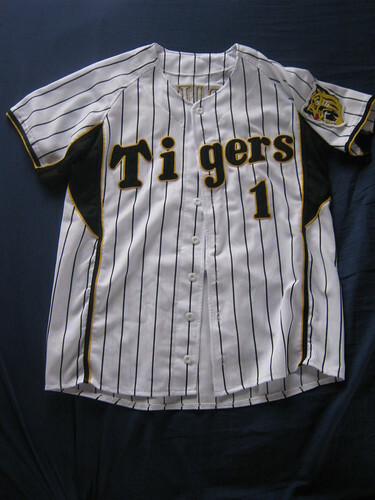 It’s still just under two weeks before the MLB baseball season is set to start, but the NPB has already gone and started its season. To be more specific, the Pacific League started its season last Saturday, but their second series won’t begin until the Central League starts on Friday. Are things looking good for my favorite squad? 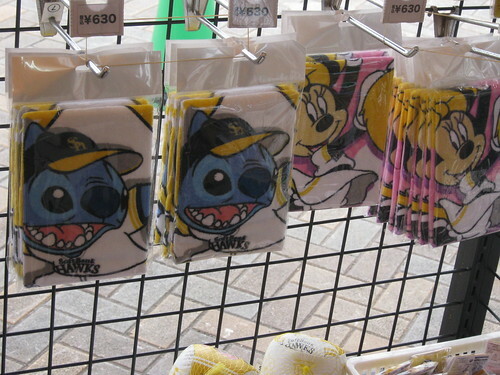 Nope, they’re 0-3 in their first series against the Orix Buffaloes. Tanaka and Iwakuma had pretty solid starts, but the run support wasn’t quite right to make either game a win. In the meantime most every MLB team is getting ready to trim their rosters down to 25 men, finalizing their rotations and starting lineups. 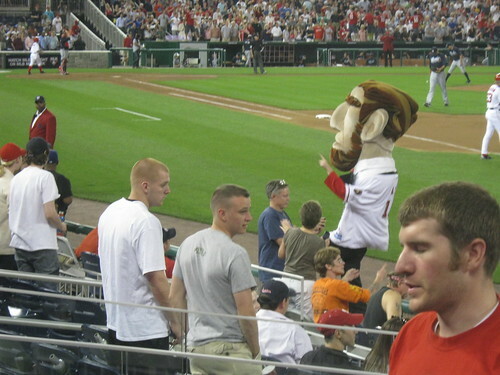 Most disappointingly, the Nationals have sent Stephen Strasburg down to their minor league affiliate in Harrisburg for further seasoning, experience, and to stave off his arbitration clock. I’m finding it tough to focus any more on Spring Training, I’m just anxious for the season to start. Ok, so I’m being a little dramatic in the title, but with David gone and most of the day occupied by riding bullet trains across Japan, the day was definitely on the dull side. 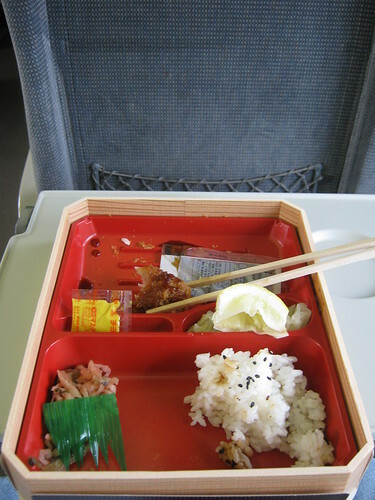 The thrilling remains of a lunch eaten on an exciting train ride to Fukuoka. Most of the train ride was spent playing Shin Megami Tensei: Devil Survivor, an SRPG whose setting is within the JR Yamanote line of Tokyo. The coolest part of the ride was the fact that we had to take an underwater tunnel to get to Fukuoka, since it is on Kyūshū, one of the four major islands of Japan. 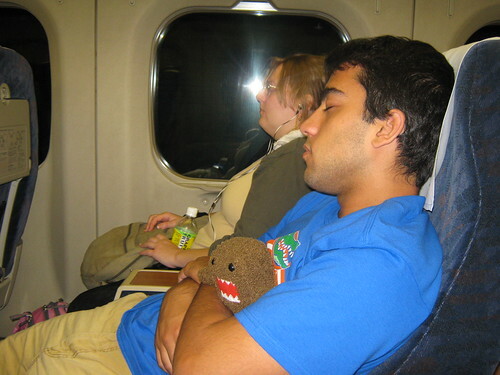 There was one other major event that occurred: the bullet train, shining example of punctuality, was ten minutes late to Fukuoka. So jarring was this tardiness that I almost got off at the wrong stop anyway because we it was time, we had to be there. I’m sure it’s not the first time the Shinkansen has been late, but it was the first (and last) time any train anywhere in Japan was late when I was there. Station, taxi, hotel. Hoo boy…the Tokyo Garden Palace, The Official JapanBall Tokyo Hotel of Choice, had a decent-sized single that they put me in. This hotel, the Fukuoka Garden Palace, put me in a hotel room single smaller than the smallest single dorm room. Funny thing is, this wouldn’t be the smallest hotel room, by any means, that I’d stay in on the trip. That title goes to the room in Kyoto, but I’m getting ahead of myself. 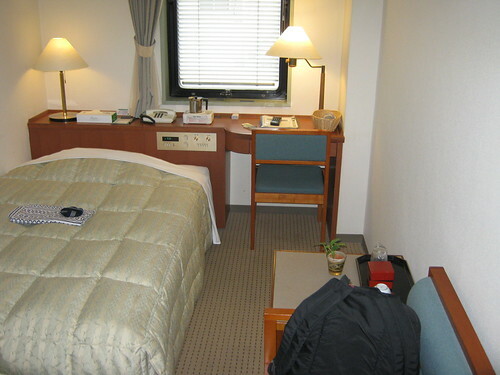 My spacious room in Fukuoka. 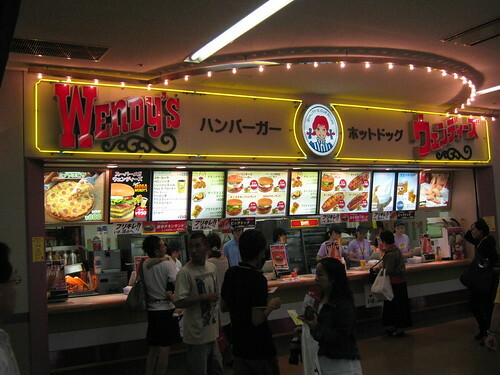 Most of the group decided to head to the local Hard Rock Cafe, but I opted not to go because I was doing my best to avoid as much Western food as I could while I was out in Japan. Beyond that, I’m not even a fan of the HRC when I am in the states thanks to its overpriced, mediocre food. 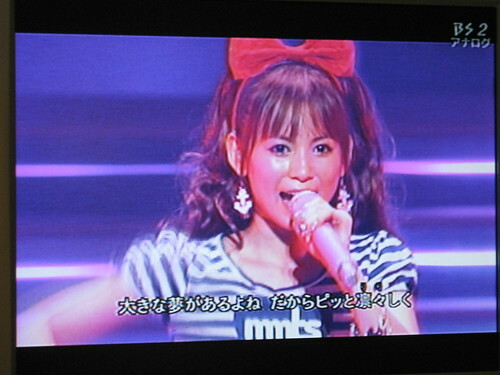 Instead I hung out in the room and watched tv/uploaded pictures for a bit before catching a cab to the the Fukuoka Yahoo! Japan Dome. Nothing like team branding to get people in a shopping mood! The shopping mall wasn’t too huge and it contained the usual Japanese staples: clothing stores, restaurants, an arcade, and a toy store. Looking to kill some time, I entered the Toys R Us and was reminded that Pokemon is still king in this country. Pokemon and Doraemon, that is. 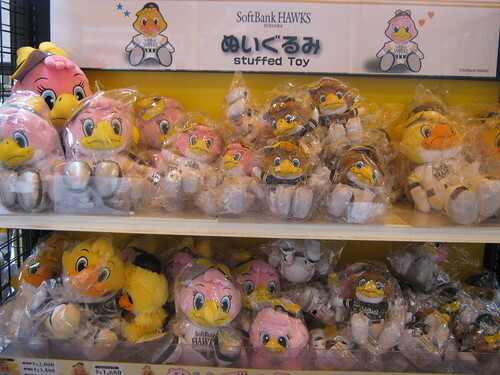 The toy store had its share of toys from other anime and video game series, but Pokemon dominated the list by far. 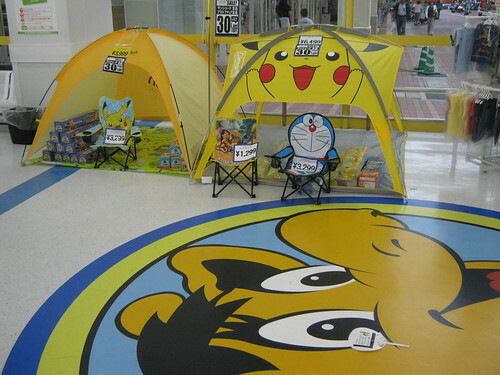 Whether it was the arcade machines near the door, the figurines, the plush toys, or the other merchandise, Pikachu and his pals were the most represented in the store. 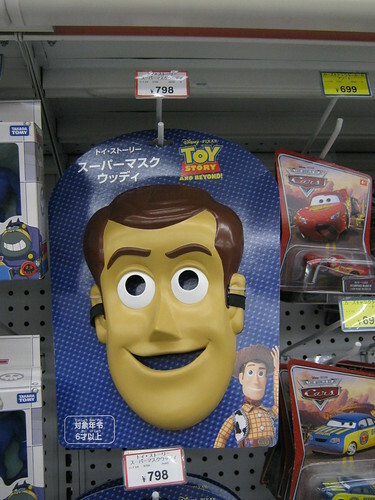 I also found a great, kind of creepy looking Woody mask. 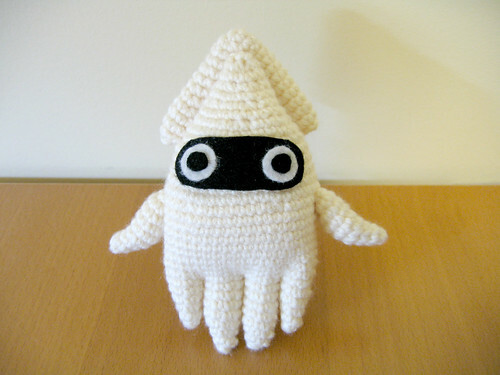 It's both awesome and kind of creepy the way those empty eyes seem to stare into your very soul. Not to mention that Yahoo! 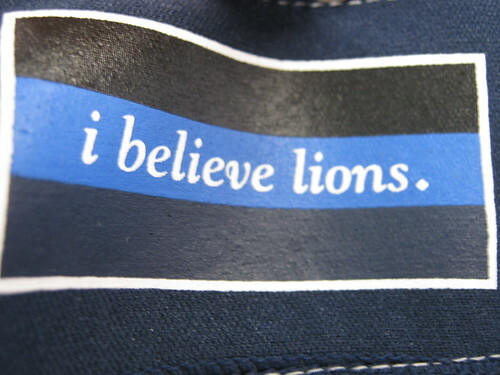 is an increasingly irrelevant brand out here in America. I have a feeling this ballpark may change names soon. 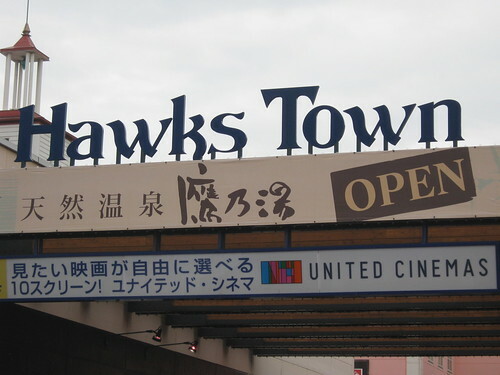 I kind of liked Hawks Town and the surrounding area because it seemed to show team spirit. 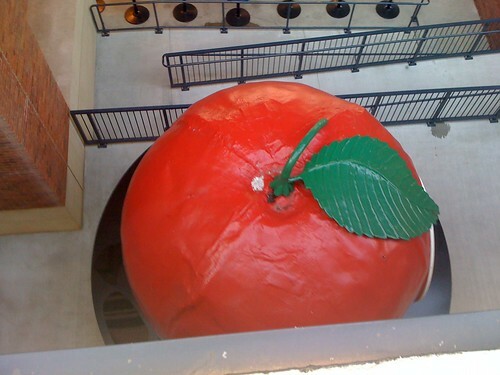 The escalator up to the ballpark was specially painted to show pictures of the mascots, which was also pretty cool. 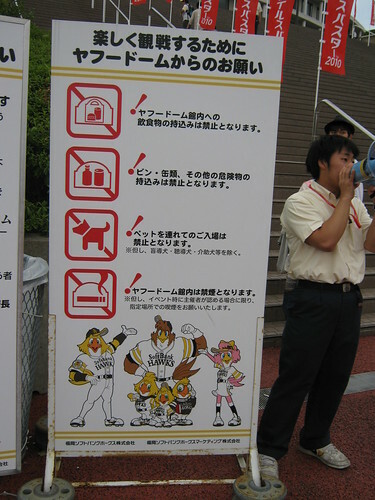 I started to notice a problem when I saw a sign showing what you couldn’t bring into the stadium. Is it just me or does it look like the final picture is saying "No burgers with cigarettes inside!" It’s not immediately obvious from the picture, but I was concerned about the number of mascots populating the bottom of the sign. Wow, I thought, there sure do seem to be a lot of them. 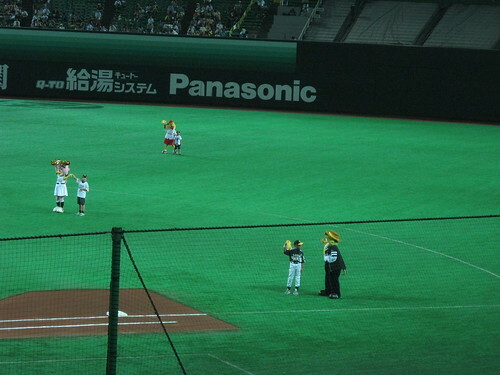 Most of the ballparks had multiple mascots, but I’d say the average count was three. 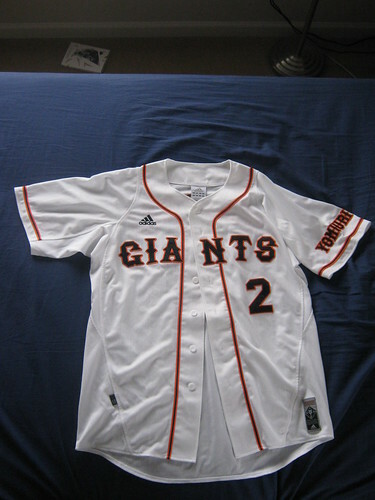 The Giants had four space bunnies (mom, dad, two kids), the Swallows had three (dad, boy, and girl), the Buffaloes, Tigers, and Marines had two each, and the Carp had one on-field and one for merchandise (the Phanatic knockoff is the former and the young boy is the latter). Represented in this picture were six Hawks. I realized why when I got up to the stands set up outside the ballpark: merchandising. Gotta collect all the mascots! 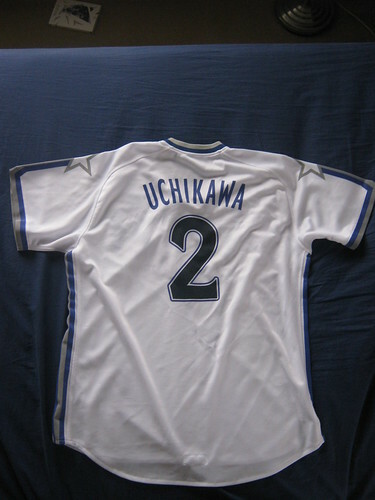 Say you’re a team located in a country that trends toward owning complete collections of things. Say you’re a team that wants to make money. Why not have a ton of mascots so that, while some will only collect the ones they like, plenty will try and complete the whole set. Release limited editions with different costumes or even uniforms and you’ve earned yourself quite a bit of cash. It’s brilliant marketing. You already know about my hatred for domed stadiums, so I won’t retread old ground, but the Yahoo! Dome’s youth works toward correcting some of those problems. 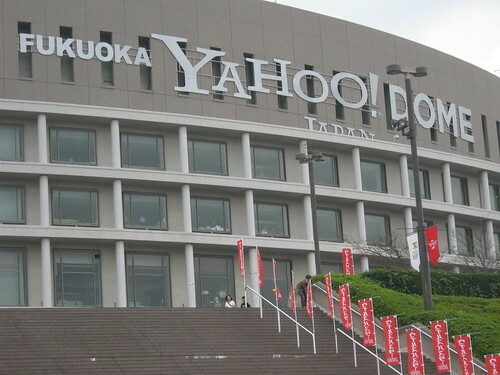 Unlike other domes in Japan, the Yahoo! Dome has a retractable roof, so fair weather can be enjoyed when it’s there while too hot days and rain can be bypassed. 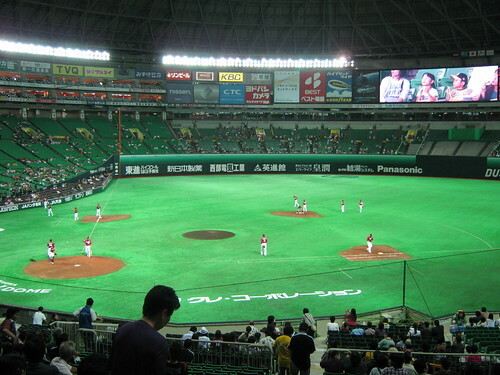 There was an ever-present threat of rain that day, so the dome remained tortuously closed that night, bringing my Games in Dome count up to 2.5 (the Seibu Dome counts for half). Another result of the dome's youth is newer, corporate food stalls. As I made my way to my seat, the full stadium greeted me in all its ad-filled glory. Aside from the batter’s eye, there was not one spot missed by the clever ad-space leasing crew. Not a bad field, for a dome, buy why bother with artificial turf when you've got a retractable roof? 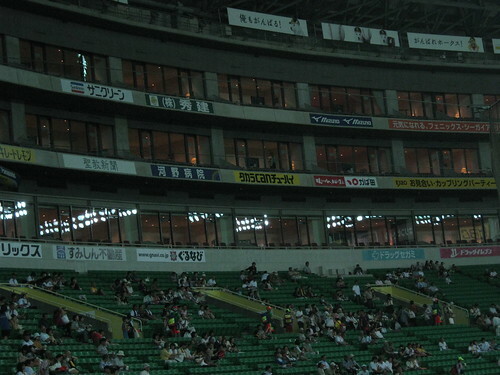 The upper sections of the stadium were filled with luxury boxes, something that was lacking in most of the smaller or older stadiums I’d been to on the trip before today. Someone needed to tell the Yahoo! folks that there's such a thing as too much luxury. There’s no escape from the advertising, even the armrests were adspace. Down to the armrests you can find ads in the Yahoo! Dome. Worse than that was that between at bats the jumbotron even showed a commercial for whatever product they were hocking that day. There is no peace in Fukuoka Yahoo! 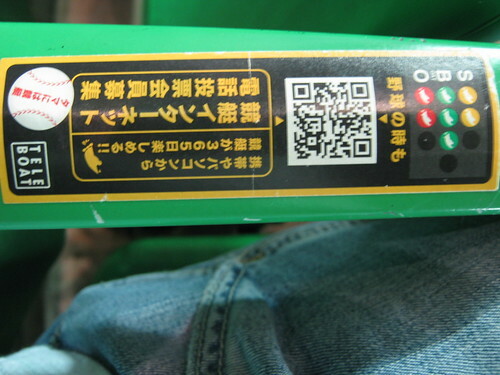 Japan Dome to enjoy the game of baseball without an ad screaming at you. Even the free fan they gave me was advertising a new piece of software. There are two things which I will always associate with the Yahoo! Dome: ads and this guy. If you couldn't tell, "this guy" is the white dude in the photo. I’m not quite sure if he’s a major part of every game or if he only comes out a few times, but this guy will always be the unofficial mascot of the Hawks. 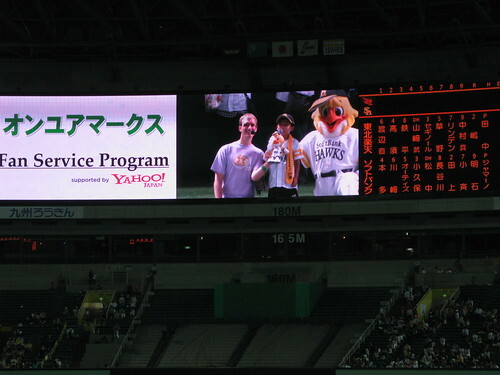 He knows Japanese well enough to speak it in a lame, cheesy, game show announcer voice and he appears in video segments before the game and during most of the between inning video segments. I’m not kidding when I say he’s as corny as they come. There’s just something about him that screams inauthentic, but it seems like the Hawks and the fans are totally into it. Let’s talk about the actual game. 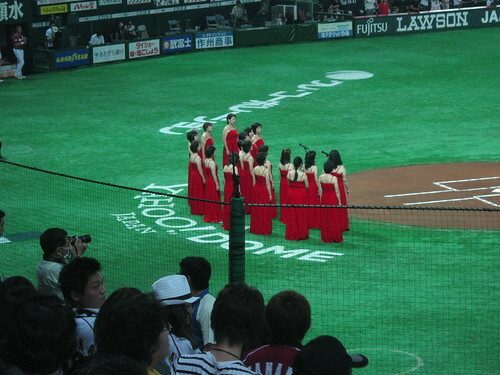 There was yet another rare instance of the Japanese national anthem being played. That’s only the second occurrence in six games and all of them were in Pacific League games. In six games we've only heard this twice. A far cry from the USA. Another thing I noticed were the elaborate team introductions. 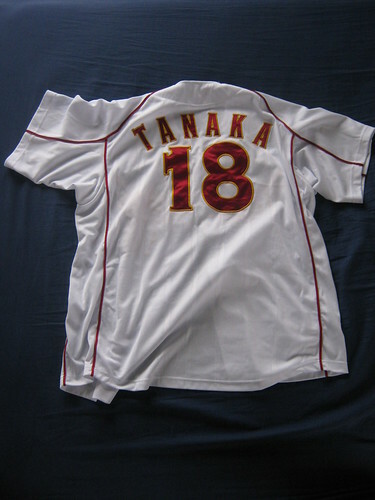 Beyond just the usual name and number, they go and put up height, weight, hometown, and handedness. It’s nothing beyond what you’d get on a typical baseball card, but it’s more than I’d seen before on the trip, so I thought I’d snap a shot. All that's missing is "Likes: Long walks on the beach"
This game also marked the first time I’d seen something kind of interesting for the kids. Instead of having the typical player introduction, a mascot and a kid went out to every position on the field (That’s nine mascots, up from the six I mentioned early. That’s right, there’s some sort of grandfather hawk and an uncle hawk and something else). The cool part is that each of these kids is there when a player comes out on the field. I would have killed to be out on the field before a baseball game to meet a ballplayer as a kid. Hell, I’d kill to do it now! Here we have some green, old Hawk mascot. It's like they're just making up Hawk variants. 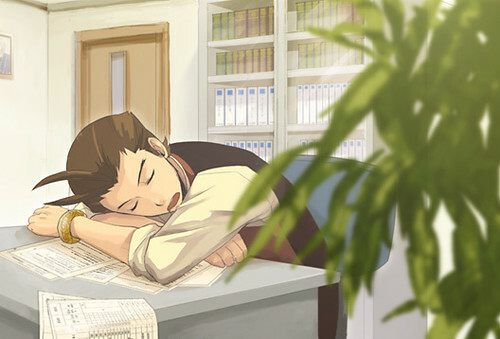 The game itself was a solid affair. It was close for most of the game, but the Hawks were ahead 3-1 by the time the game entered the ninth inning. Some teams would give up, but they’re not the Golden Eagles. Thanks to a pitiful performance by their closer, the Eagles were able to knock in six runs in the ninth, four of which came from a grand slam. For the rest of the trip, my fellow tourgoers and I would remark that a team was not yet safe in the ninth until it had passed beyond Grand Slam Range. If only she knew what kind of heartbreak was awaiting her that night. 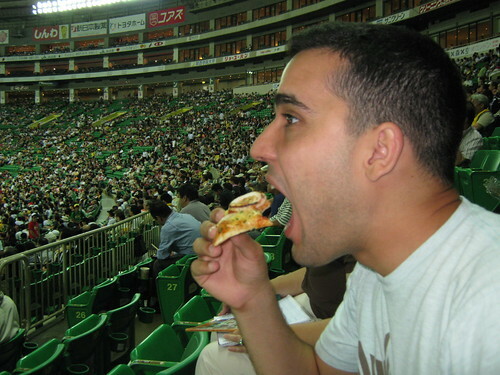 As a quick aside, at the ballgame I ate something I’d never had before and would absolutely love to have again. 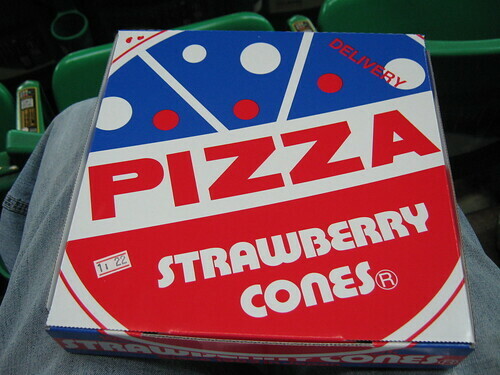 Tell me, would you trust a pizza from a place called Strawberry Cones? Everyone knows that Strawberry Cones is synonymous with pizza! 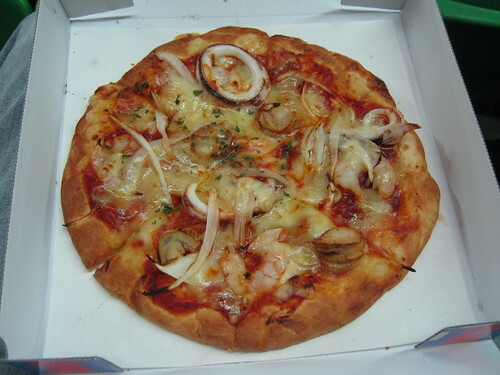 I saw the stand and almost dismissed it off hand for being Western food in Japan, but then I saw a picture of one of the pizzas they offered, and I knew I had to try it. Only one problem, the guy in front of me got the last one. The only thing left to do was pray for symmetry and walk around the stadium searching for another stall. The pizza in question. Yes, those are shrimp, calamari, and other miscellaneous seafoods. 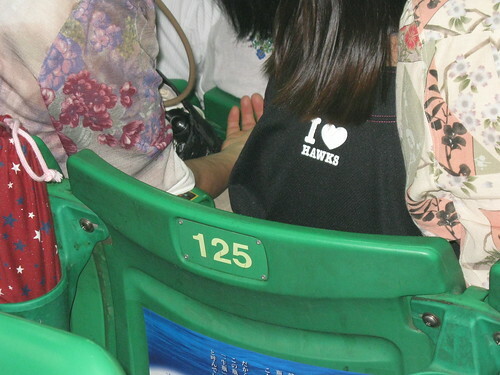 And that was all she wrote for the Hawks and Fukuoka. We took a cab back to the hotel and got set to head back to Kyoto the next day. 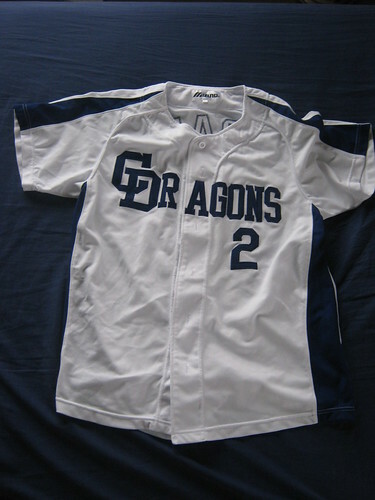 It would be our home base as we went to see games in Nagoya (the Dragons) and Nishinomiya (the Tigers). I’ll close with a picture of the hat of my favorite vendor at the Yahoo! Dome. It's blurry, but it's the best I got. 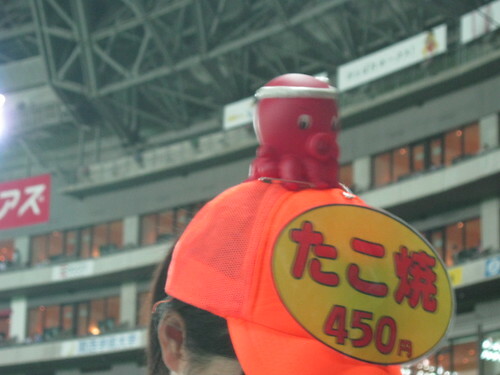 This is the hat of a takoyaki vendor at the Yahoo! Dome.